From the Northern part to the Southern part of the country, Vietnam hosts an incredibly dynamic territory of beautiful sceneries and diverse architectural marvels. With a rich historical background and exquisite cuisine, the country offers a unique experience as a holiday destination. 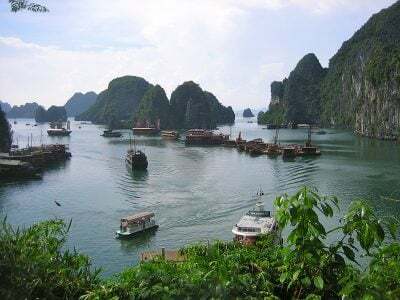 This tour is specially designed to take you through some of the aesthetically pleasing sights of the country, starting from the illustrious capital city of Hanoi to the sandy beaches and thick jungles of Phu Quoc Island. The tour is 21 days and 20 nights long, taking you deep into the core of the country and acquainting you with the rich cultures, lifestyle, and cuisine of the many ethnic groups in the country. During the tour, you will explore some of the hill tribe villages of Sapa, the vast Ba Be lake with its islands and inflows, the spectacular Ban Gioc Waterfalls and the abundant lakes and emerald waters of the Ha Long Bay. You will also discover the Red River Delta city of Ninh Binh, the ancient city of Hue with its famed Citadel and Imperial Palace, the pagodas and hidden Buddhist shrines of DaNang and the winding streets of the Ancient Quarter in Hoi An. A trip to the most populous Vietnam city, Ho Chi Minh will also be featured, exploring its many pleasant sights and also visiting the heart of the Mekong Delta (Can Tho). The tour is concluded with a departure from Ho Chi Minh City, leaving you with unbridled positive energy from your action-packed exploration of the eclectic landscapes. You will enjoy a city-wide tour of the capital city, visiting the Tran Quoc pagoda and the Ho Chi Minh complex which houses the Ho Chi Minh Mausoleum and the President’s Palace. You will also explore the Ho Chi Minh Museum and the One Pillar Pagoda after which you’ll be treated to lunch in a local restaurant. Following lunch, you will visit the first imperial University in Vietnam, the Temple of Literature (Van Mieu – Quoc Tu Giam) and the Ngoc Son Temple which is surrounded by the Hoan Kiem Lake. Here, you will be regaled with the tale of the legend of the turtle in the lake. After relaxing in the evening, you will take an overnight train to Lao Cai. 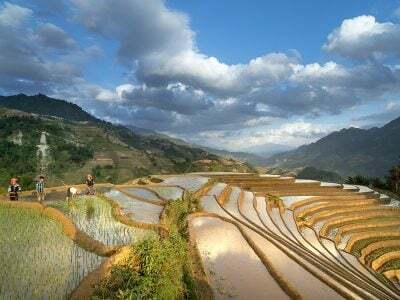 On arrival at Lao Cai Railway station in the early morning, you will be driven to Sapa town, have breakfast at a local restaurant and then take a trek to Lao Chai Village with a picnic along the way. You will encounter some of the friendly hill tribe people and their villages with beautiful scenery and waterfall. You will spend the night a homestay with a local Zay ethnic family. After breakfast, you will head to the colorful Bac Ha to explore the bustling Sunday Market with diverse goods and ranging from traditional textiles to live animals. You will take a walk in the afternoon to Ban Pho village where you will get to interact with the friendly people. 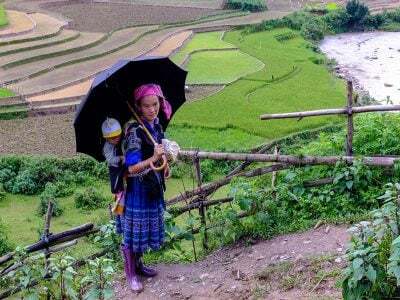 You will then take a drive to Ha Giang, where you will have dinner and stay at a homestay with a local Tay family. From Ha Giang, you will take a trip to Dong Van, having lunch along the way at Tam Son, a beautiful mountain town. You will. Encounter the H’mong’s place and continue your journey to the Hoa Cuong Hotel, where you will have dinner and spend the night. You will take a visit to the Dong Van Market and afterward explore the French Fortress of Pu Lo After which you’ll head to Bao Lac village, by way of the Meo. Mac Valley, where you’ll have lunch and then take a mountain road to your hotel in Bao Lac, where you will stay overnight. You will visit Lo Lo Village and discover the Black Lo Lo in Cao Bang Province with their black cultural wears that earned them their name. You will then take a drive through a small road snaking through the mountains to arrive at Ba Be lake, where you will be welcomed by a friendly Tay family. You can take a dip in the alluring waters of the lake and afterward enjoy a tasty dinner with the family. You will depart from Ba Be lake and head towards the Ban Gioc Waterfalls, along the way, you will encounter the Nung people of Phuoc Sen village. 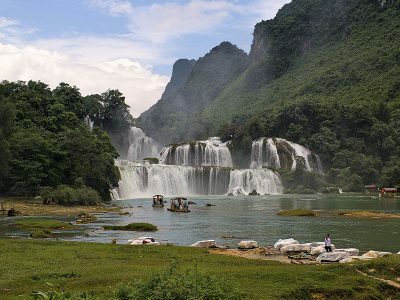 The Ban Gioc Waterfalls span halfway in China and the other half is in Vietnam. It is surrounded by a brilliant environment that is perfect for relaxation and fun activities. You will also discover the Nguom Ngao cave and then head back to Cao Bang for the night. You will take a drive to Ha Long Bay, board a boat and enjoy a cruise through the Ha Long Bay. You can explore the floating fishing village of Vung Vieng via a bamboo row boat or the inviting Ban Chan Beach. Afterward, you can freshen up and lounge on the bay, enjoy a spectacular cooking demonstration by a skilled chef, treated to dinner and have fun dancing and doing Karaoke. You can join an early gentle Tai Chi session before breakfast on board while cruising towards the structures of the beautifully lit Thien Canh Son Cave. Later, you will begin the boat ride back to the harbor, enjoying lunch on board. Boat trip to the small city of Ninh Binh, exploring the limestone formations of Van Long and the old temples of Hoa Lu Ancient capital with an abundance of beautiful sights. Afterward, you will take an overnight train to the ancient city of Hue. You will be welcomed at Hue, a world heritage designated center. The Royal-themed architecture of the city boasts of attraction sights such as the Lady Pagoda, Minh Mang’s Tomb, the Forbidden City, the Royal Citadel and Museum and the ever busy market of Dong Ba. You will have lunch in a local restaurant and have the evening free to spend as you wish, spending the night in Hue City. You will travel towards Da Nang, through Lang Co and the Hai Van pass. In Da Nang, you will explore the Cham Museum, My Khe beach, and the Marble Mountains. You will head to the old town of Hoi An, where you will spend the night at a hotel. A tour of Hoi An city, featuring the streets of the Ancient Quarter, temples, pagoda, and the Japanese Bridge. You will take a boat trip on the Thu Bon River to see the people of Kim Bing Village. You will retire afterward to the Cua Dai Beach, where you may freshen up and relax for the night. After breakfast, you will be transported to the airport to board a flight to the sandy beaches of Nha Trang. The rest of the day will be yours to spend as you wish, whether by relaxing at the beach or taking refreshing dips. You will enjoy your morning in Nha Trang before taking an afternoon flight to the most populous city in Vietnam, Ho Chi Minh City. After a drive to the Mekong Delta, you will enjoy a boat trip through interconnected canals to An Binh Island. You will enjoy a walk through the village, exploring some of its edifices such as a coconut factory and local workshops. After lunch at a local garden restaurant, the boat ride continues, taking you to Vinh Long followed by a drive to Can Tho where you will spend the night. 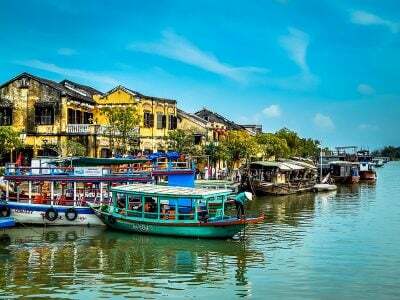 Can Tho is the heart of the Mekong Delta, its biggest attraction being its floating markets which you will visit in the early morning before taking a flight from Can Tho airport to Phu Quoc Island. Phu Quoc is the largest island in Vietnam, having undergone numerous transformations over the years. It is a haven of sandy beaches, sparkling blue water, thick jungle, and a large mountainous range. You can bask in the sublime ambiance of this glorious island, relaxing and maybe taking some snapshots for posterity. You prepare for departure as you take in the sights for the last time on this tour before taking an afternoon flight to Ho Chi Minh City. And so, the action-packed, fun-filled and amazing 21-day experience comes to an end, leaving you with impressive memorabilia of wonderful, frozen moments.